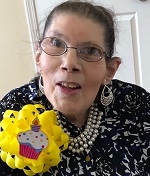 Margaret Berlin, 72, of Farmington Hills, Michigan, died on 06 February 2019. The Funeral was held at IRA KAUFMAN CHAPEL on Friday, 08 February 2019 at 11:00 AM . Rabbi Joseph Krakoff officiated. Interment at Adat Shalom Memorial Park.